Many discoveries in science are serendipitous and the subject of our evening lecture, gamma ray bursts, was no different. Prof Andrew Levan from Warwick University explained how these amazingly bright yet relatively short-lived events are the most luminous events since the beginning of our Universe. Like random fireworks they chaotically brighten our sky both day and night and yet they were not discovered until the 1960s when scientists were looking for something completely different. Back in the Cold War era scientists were tasked with the detection of "illegal" nuclear explosions since Russia, the UK and the USA had signed the Partial Nuclear Test Ban Treaty in 1963 prohibiting any nuclear tests that were not underground. Any nuclear explosion emits a burst of gamma rays which, just like light rays, are a form of electromagnetic wave but are at very high frequencies and energies. 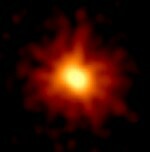 The first gamma ray burst (or GRB) was recorded by a US satellite called Vela on July 2nd 1967 but the results were not published in a scientific paper until 1973. Different theories were proposed as to the source of these mysterious emissions. Some researchers thought they came from within our own Solar System, others that they originated within the Milky Way and another view held that they were from the far distant corners of the Universe. It was only with the launch of NASA´s Compton Gamma Ray Observatory in 1991 with a sensitive gamma ray detector that narrowed down the GRB origins. The GRB sources were found to be isotropic, i.e. they were scattered randomly across the sky. This showed that they couldn´t come from within our galaxy otherwise they would be concentrated within a thin section of the sky where the flattened disc and central bulge of our spiral galaxy is found. The data also revealed that the GRBs were split into two types - short and long bursts. The short bursts last up to 3 seconds whereas the long bursts last from 3 to thousands of seconds. In 2007 NASA launched the Swift spacecraft which had not only a gamma ray detector but an optical telescope that could be quickly slewed to the source of an outburst. Finally the source of the GRBs was pinned down to faint galaxies at extreme distances. The GRBs were found to be coming from areas within irregulary-shaped galaxies where large stars were rapidly forming. It is now proposed that long-duration GRBs are the result of massive stars coming to the end of their lives and collapsing before forming a black hole. Whereas short-duration GRBs occur when two neutron stars which are in orbit about each other spiral inwards and eventually merge. In both cases a stream of energy is concentrated at both poles of the collapsing system and is beamed out like a lighthouse beacon across the Universe. On 19th March this year a GRB was observed that was so bright it would have been visible to the naked eye. It originated at a distance that was halfway to the edge of the observable Universe. It is lucky for us on Earth that they are normally found at such distances as a nearby burst would certainly lead to the destruction of life on our planet as we know it.